« SSMT 2017: Verse 24! ***UPDATE: Because there has been such great interest in Invited, and due to limited seating, we have decided to open registration! Book your seat here! Hey girls! Lots of new and exciting things are stirring at Living Proof in 2018 and we are especially thrilled to share this one with you! Starting Wednesday evening, January 17th, we will be hosting a monthly ministry night for women who’d like to participate. I’ve longed for some local hands-on ministry where the Holy Spirit is invited to create an environment for effective, fervent prayer and for building up our faith in God and His Word. By His grace and goodness, this prayerful longing is resulting in a new once-a-month gathering we’re calling Invited. It will differ a bit from what I have the privilege and passion to do the rest of the time. If you’ve been to our other events like local Bible studies here in Houston and Living Proof Live events around the country, you know that our usual approach is a half hour of uninterrupted praise and worship followed by a 60-75 minute Bible lesson complete with points on the screen, Greek or Hebrew word definitions, quotes, commentary excerpts and concepts developed into what I always pray will be a comprehensive theme. This is my favorite method and will continue to be my absolute priority. But I also have a deep yearning to be part of a night each month that creates more space for prayer. We are each and all in desperate need of prayer and, for many of us who genuinely love God and His Word, it is our weakest muscle. We were promised that we would receive power when we received the Holy Spirit and, if we’re in Christ, indeed we have but often faith-filled prayer is what God uses to activate that supernatural unction in us. We aren’t meant to barely eek by. We’re meant to abound. Yes, we’ll always have difficulties and sufferings but we can still flourish in our faith and either see God move mountains or climb them to get a better view of Him. …where I can bring a word I’ve sought from God and prepared but one that is deliberately shorter, free of handouts, power point slides and minutely-detailed scripting. …where prayer and worship and the Word of God are not as segmented as most of our services (and often appropriately so) but integrated more spontaneously throughout the gathering. It’s just bare bones. The kind of bones we pray God will raise back to life. A mega sanctuary is a fabulous place for Bible study but not as conducive to the environment we’re hoping God will appoint for this event. Bayou City Fellowship, my home church, has welcomed us to hold Invited in their sanctuary and it will be the perfect size. We will move the event into our new Bayou City Fellowship Spring Branch location for the sake of inside-the-city-proximity as soon as it’s finished by Summer but we’re going to meet at our Cypress campus until then. You’ll find the address at the conclusion of this post. If you’re familiar with the term “seeker-friendly,” I can’t necessarily tell you that Invited will be the best environment to spring on a lost loved one, neighbor or friend but she is certainly invited, especially if she is desperate for prayer. It will be a place where people will be free to go to their knees or their faces in prayer if God so leads and where we might be directed to turn to several people around us and pray for one another or for our city or for the lost or grieved or broken. You get the idea. This event will not be designed for spectators. This one is for participants but, as long as you’re willing to participate, you don’t have to have an iota of experience. If you’re brand new to this whole faith-thing and want to come, by all means, do! I just want you to have an idea what you’re walking into. 🙂 At Invited, our goal will be to seek the One who is ever-seeking us. It won’t be slick. It won’t be Tweety. Instagrammy. Or Snap Chatty. But I pray it will be real and worth somebody’s time. I long for it and, if you do, too, let’s see what God might do. You guys are wonderful. Please pray for this event even if it’s not possible to attend or not really up your alley. I’m deeply grateful for the privilege to serve you! Tons of love to you. This entry was posted on Monday, December 18th, 2017 at 3:38 pm	and is filed under Uncategorized. You can follow any responses to this entry through the RSS 2.0 feed. You can skip to the end and leave a response. Pinging is currently not allowed. Hi Glenna – there is no sign-up, you just show up! I am very interested in attending. I completed my very first Beth Moore Bible study this summer. Do we just show up? Hi Joy! Yes, just show up! Yaayyy, but also “noooooooo!” The former is coz I do so agree that we need PRAYER, and corporate prayer at that in these times. The latter is coz I’m on the east coast and won’t be able to physically attend. So could you please please do a virtual meeting? Pleeeeeeeese? Hi Ciru, we’re so thankful for your interest in joining! We have decided to keep these “Invited” events low key, with a focus on serving our local community. We won’t be doing a virtual meeting, but we would love for you to join us if you are ever in the area! This sounds so much like the ‘prayer meetings’ we would have at church when I was growing up. (The mid-week service.) Sometimes those services were just so alive and it was like the Holy Spirit just moved right in a took over. We would sing and somebody would testify, everybody would start crying, people would go to the altar to pray and the cycle would start all over again… Beth, I loved it and would love to be a part of a church or service where they allowed the Holy Spirit to move as freely as in those services I remember so well. I wish I could be a part of this as it sounds like it is just what I need. However, WV is a good distant away from Cypress, TX. I hope this new endeavor makes a difference in the lives of MANY women! Dearest Beth, I could not be more excited about this! Sometimes, I feel like a baby just taking her first wobbly steps when it comes to prayer. I have so much to learn and grow through the power of the Holy Spirit. Thank you for listening to Him and being open to new and fresh ways to grow and learn and worship! I. Can. Not. Wait! Point out anything in me that offends You and lead me along the path of everlasting life. Oh, dear, Mrs. Beth! I just did a jig over this. Excited and expectant for what the LORD has in store. I’ve been aching for a women’s prayer night. I’m praying for a fresh wind, fresh fire in our bones, fresh words on our lips for one another from Him, and really just Him to BE with us and change things. Asking for so much in this time. Thank you for leading in this. And amen. Time to flex. this. muscle. If women across the country would like to have “Invited” groups, would the text of “word from God” that Beth prepares be available as an intro? If not the actual text, then maybe the scripture reference or theme? Little pockets of prayer warriors for Jesus on our knees before the throne of grace…maybe we will just start a group on our own…hmmm? May He find us obedient! Would this be a possibility, Media gals ? Any way to participate from a distance? Web cast?? Hi Cornelia! We’re so sorry, this event will be quite low-key and will be only for a local audience. We’d love for you to join us if you’re ever in the area! This is an answered prayer. Thank You Lord! Lifting up thanksgiving to God for this gift. What an answer to the longings of my heart. Thank you for responding to this invitation from God! Wish I could be there with you all! Since I can’t, wanted to pass along some encouragement to my fellow siestas! With the change of seasons, the days are noticeably shorter and darkness seems ready to pounce long before I’m ready for it to come. It was on one of those short, winter days several years ago that I attended a different parish for Saturday evening Mass. Large brilliantly colored stained glass windows crowned the top of the sanctuary walls. As darkness descended and sunlight no longer streamed through to fall in graceful rainbow shades, the windows looked dull and lifeless. Without sunlight, the stained glass windows lost their radiant beauty. It wasn’t until I was outside in the enveloping darkness that it hit me like a revelation. Glowing with the warm light of the sanctuary, the stained glass windows were vibrantly alive – shining their beauty into the night. What had seemed so dull and lifeless to the interior, was a stunning display of beauty for all to see. During the inevitable nights of the soul, when darkness presses in heavy around us and all seems dull and lifeless in our internal landscape, if we hold fast to the light of Christ, beauty will shine forth through us. This will be wonderful. I’m expecting great blessings and for lives to be blessed in new and exciting ways. THEN, those lives will bless others in new and exciting ways as they draw closer to the Lord. Living in NC prevents me attending in person but I will be in prayer for this gathering. I really enjoy your studies, which always ignite in me a new thirst for getting to know God and His Word more. For those who would like to have something like this in their own town/church/area……..start praying sisters…..God answers and will provide! YOU just might be the one He leads to start one in YOUR church! I am so excited! I went several of your local weekly Bible studies at FBC Houston. Always a special takeaway. Ah, if I only still lived in Houston! Georgia ia a little far to commute. What a beautiful thing you are doing–many, many prayers for much fruit! Please consider live streaming this so that others in the U.S. can participate from afar and pray. There is no need to acknowledge us…just invite us to enter in with you. How wonderful it would be to join you in this opportunity to pray along side you and your local women. Love you, Beth! Hi Judy! Thank you for your kind words and your interest in the event! Unfortunately, we won’t be live streaming the event as the focus is more on serving our local community. We would love to see you there if you are ever in the area! YOU MENTIONED THAT YOU WISHED YOU COULD HEAR FROM ALL THAT DO IT. WELL HERE IS ONE THAT IS ENJOYING IT. WHEN I LEAD MY GROUP WE ASK GOD TO BLESS YOU FOR WRITING SUCH WONDERFUL BIBLE STUDIES. WE JUST FINISHED LIVING BEYOND YOURSELF AND I AM FULL OF THE FRUIT OF THE SPIRIT. I DO BREAKING FREE ABOUT EVERY FIVE YEARS. NOW I HAVE DECIDED THAT I NEED TO DO LIVING BEYOND ABOUT EVERY FIVE YEARS. GOD BLESS YOU AND YOUR FAMILY. WE ARE ALWAYS PRAYING FOR YOU. Thank you for sharing this beautiful opportunity to pour into your local community through prayer, worship, and His Word. It grows such an excitement within me as God interconnects us, the bride of Christ, around the globe for greater effectiveness to give Him glory through all of the various notes that He has given us to worship Him and to seek Him fervently in prayer. This, too, is the direction that has stirred my heart as I serve as a worship pastor’s wife in Blair, NE, gathering our women’s ministry and church family to worship, pray and speak His Word together, an intermingling of the power of His Word with prayer and praises alongside the creative arts in worship, as the Holy Spirit empowers us to proclaim the testimony of Jesus, as He transforms individuals, families, churches, communities, and the entire globe. Thank you, Mama Beth, and Living Proof team for the countless hours that you have invested in propelling our communities of faith forward together, interconnecting us as we carry the glorious Gospel of Jesus Christ across the globe. Are tickets available to Invited as I will be in Texas the week of January 17th? Hi Megan, there are no tickets for the event – Just show up! We hope to see you there! By FAITH, planning on being there. Just made flight and hotel and car rental reservations. I felt led to join this prayer gathering. Believing GOD is going to do something very special in this. His Presence is the fullness of life. I seek His Presence. Believing for Him to be very evident. This is a wonderful way to start 2108. Revelation 1:3 says: Blessed is the one who reads aloud the words of this prophecy, and blessed are those who hear it and take to heart what is written in it, because the time is near. O THE TIME IS NEAR! Let us keep drawing near to He is Near, His Appearing I/we long for! Happy 2018 The Best is Yet to Come, bc He is Coning! Will this be live streamed? We’d love to join you from long Island, NY. Hi Jann! Thank you so much for your interest in Invited. Unfortunately, we will not be live-streaming the event. This event is a little different from other events, and Beth’s focus is specifically on serving our local community here in the Houston area. Thank you for understanding. If you are ever in the area, we would love for you to join us! Wasn’t sure where to jump on and put this so here goes: HAPPY, BLESSED ANNIVERSARY, Beth & Keith! WE LOVE YOU!! HAPPY NEW YEAR! This, like some of the others who live too far to take part, resonated so strongly with me. So, I am asking God if He can use me to implement such a group here in my community then I loooong to replicate for those who live here in my neck of the city. I have such a longing to make the beauty of the Savior known, but I can already sense the enemy trying to discourage. Stepping on in faith believing. So, I am asking God if He can use me to implement such a group here in my community. I loooong to replicate for those who live here in my neck of the city. I have such a longing to make the beauty of the Savior known, but I can already sense the enemy trying to discourage. Stepping on in faith believing. Just wondering since this is on your internet blog, will this be available for all of us who follow on the internet? Thanks, and Happy and Joyful New Year! Hi Kim! Unfortunately, we will not be live-streaming the event. This event is a little different from other events, and Beth’s focus is specifically on hands-on serving our local community here in the Houston area. Thank you for understanding. If you are ever in the area, we would love for you to join us! Wow this sounds so awesome, wish I could attend but I am in Illinois. Is there any way it could be live streamed like IHOP in Kansas City does their 24/7 prayer room? Hi Cindy! Thank you so much for your interest in Invited. Unfortunately, we will not be live-streaming the event. This event is a little different from other events, and Beth’s focus is specifically on serving our local community here in the Houston area. Thank you for understanding. If you are ever in the area, we would love for you to join us! I can’t find anything anywhere…is there going to be a SSMT 2018. I sure hope so as it is so much fun. Hi Linda! Unfortunately, there will be no 2018 SSMT. However, Beth has launched a new Scripture memorization challenge: memorizing Galatians! If you are interested in participating, you can follow along the “Memorizing Galatians” Facebook page where Beth will post updates: https://www.facebook.com/Memorizing-Galatians-267002807161858/. Is there an alternative for those of us who are not on Facebook? Somewhere on the LPM app for participating in memorizing Galatians? Thank you for considering this. Hi Carolyn! Unfortunately, Beth will only be posting updates to the Memorizing Galatians Facebook group. This seemed to be the best way to reach the most people. Thank you for understanding! I have noted all dates in my calendar. Will they all be from 7 to 8:30? Hi Cristina! That is the plan, for now! Is this program live on line via your website or just for Texas locals. I live in Madison Miss. I would love to watch and participate via social media. Nevermind. I see the answer to my question. Hi Susan! Thank you for your interest in Invited! However, the event will only be here in Houston as our desire is to serve the local community. We would love for you to join us if you are ever in the area! Is this only at the physical location? Not online? I’m in MO and this sounds so precious, would like to attend but a little far to TX. Hi Faith! The event will only be local, here in Houston. We’d love for you to join us if you’re ever in the area! Just a thought on all this. I think it’s great and pray God manifests Himself to each person who is able to attend. Our church is now moving more into prayer as we’re getting into the New Year. And we’re a very large body and our pastor will be leading us through prayer and fasting for 21 days starting this coming Sunday. I’ve seen what God can do over the years and I’m asking Him to do more; actually to show us more of Himself and to help us to see what only He can do and we’ll know it’s Him and the people will know it’s Him. I’ve even felt led to leave everyone else’s Bible studies alone, at least for a while and just study the the word in our small group along with commentaries, etc to learn together what God has to say. May we all experience more of Him and His Word actively at work in us and through us. That’s what I want. Any possibility of live-streaming Invited for those of us who aren’t in the Houston area but who are desperate for that kind of worship, word and prayer? Please, please, please!!!! Hi Barbara! Thank you for your interest in Invited! This event will be low-key and, unfortunately, we won’t be live streaming. 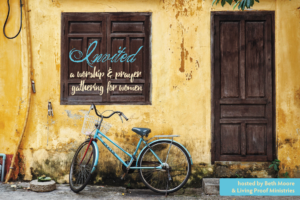 Invited is geared toward serving the women in our local Houston community. We would love to see you there if you are ever in the area! I saw a video w Beth about memorizing Galatians. Now I can’t locate. Can someone help me? Hi Kim! 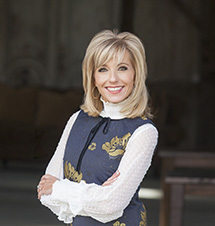 You can find Beth’s first video pinned to the top of the Living Proof Facebook page: https://www.facebook.com/BethMooreMinistries/?ref=bookmarks. The rest of the Memorizing Galatians updates you can find on the “Memorizing Galatians”Facebook page here: https://www.facebook.com/Memorizing-Galatians-with-Beth-Moore-267002807161858/. Due to the weather is this event still on?